Clarendon’s design inspired by the vibrancy and character of the market. A successful restaurateur is a mix between a shape-shifting number-cruncher, an agile tightrope acrobat with aerialist aspirations, an eagle-eyed pitbull with balls of steel and a refined epicurean of unknowable depths. These creatures often work in the shadows, rarely get the accolades nor, to be fair, the scathing reviews their chefs do. It would not be a stretch to say that our world would be tasteless without them. Enter my friends Caroline Gosselin and Peter Boole who, together, have formed an enduring partnership over two decades in a world of unforgiving rocky shores strewn with carcasses crowned in wilting laurels. The success they have achieved in not only staying open but afloat and relevant in our fickle seas of change is remarkable and rare. 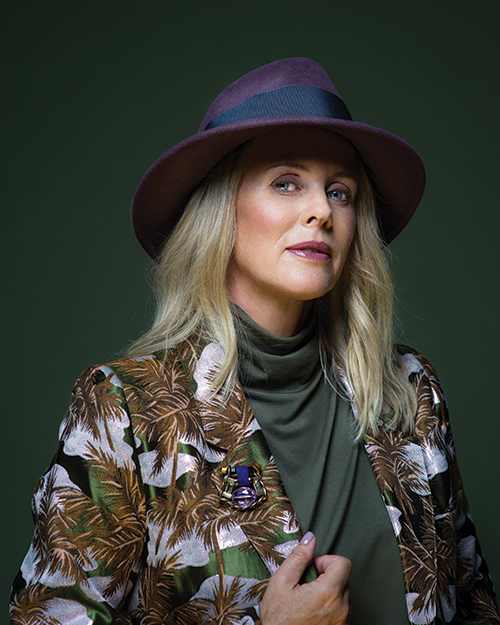 Together, they own the iconic e18hteen and Sidedoor, as well as the newcomers Jackson and Clarendon Tavern. Peter also owns the ageless Social on Sussex Drive. 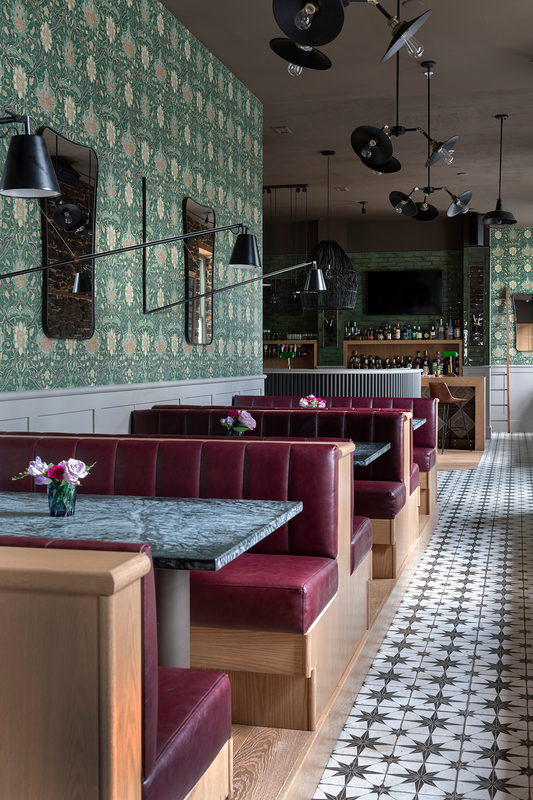 Restaurant design is as hand-wringing a process as it is a deeply rewarding one, and quite ironically for the very same reason: time, or more succinctly, the lack thereof. Restaurants cannot stay closed too long before opening, or the ship will sink before she even hits water. To a designer, this means most decisions are to be made upfront, well before the ink is even dry on the rental or purchase contract. If you are getting a sniff of a gamble here, take that to the bank: The restaurant world is not for the weak of stomach, nor for profiteers. It is a vocational world of mavericks with a flair for the theatrical and madmen with a weakness for the delectable. The ultimate sidekick of a restaurateur is the designer whose primary aim is to be the Rorschach equivalent to the owner’s food. Over the past three years, I have had the honour of being the splattered ink put through this blotting not once, not twice, but a total of four times. I think it is important to this story to disclose that Peter and I have been in a lasting and committed relationship for exactly the same amount of time as he has redone his entire fleet of eateries. Yes, feel free to go ahead and think it: Our relationship is a miracle. It was with a certain amount of trepidation that I walked through the Clarendon’s rooms last Christmas. Peter had not signed the lease agreement and yet, looking over at the fire in his eyes, I knew it was all but a done deed: My man likes a good story, and The Clarendon Tavern had it in spades. One of the oldest buildings in Ottawa, the Clarendon Hotel opened in 1864, briefly served as Army barracks until 1871 and reverted to a hotel until 1879, when the Government of Canada bought it. From the early days, the building took on value as a place that held significant public services and cultural institutions. 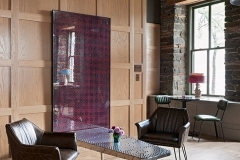 Interestingly, the building was used to host the inaugural exhibit of the Canadian Academy of Arts whose works formed the initial collection of the National Gallery of Canada. When you own a portfolio of eateries, you try and balance it. Caroline and Peter’s savvy lies in riding the market’s ups and downs, or—in the Clarendon’s case—reading it every which way. 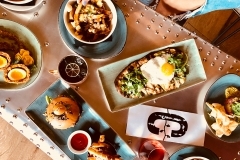 In our Ottawa market saturated with new restaurants (increased offer) and a stagnant population of patrons (decreased demand), they saw an opportunity to serve simpler fare at lower prices. In case you think this may be an easy feat, I would like to refer you to a coffee mug for sale at our National Gallery shop that says, “To those who look at a Picasso and think, ‘Easy. I can do that’”, the answer is, ‘But you didn’t’. Enter the aforementioned high-wire act: How do you create dishes that cost less, look good, taste great, all the while keeping them flavourful and fresh? 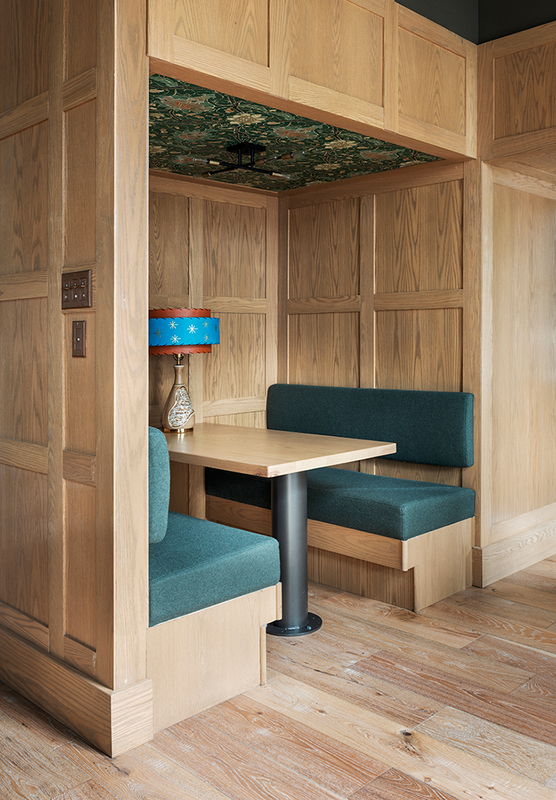 The large dining room flaunts a Safavieh wool area carpet that echoes the shapes, texture and colours of the Cole and Son wallpaper in the bar area. The entire space is anchored by a whimsical Heidi Conrod mixed-media piece. The simple two-word answer is: David Godsoe. Godsoe may be the very best kept secret to us non-foodie-in-the-know lay(wo)men with an appetite: The talented chef who took over the mantle at e18hteen is performing his very own culinary Rorschach at The Clarendon Tavern. With brilliant gusto, he has composed a menu where every plate, including mains, is under $20. In case you may think this is a typo, I wrote a two followed by a zero. To put this into perspective, I would like to let you in to a dirty little secret of my own. It is so dirty that my boyfriend has an alias for it: I sometimes swerve off the road to my cottage to eat at my “favourite Scottish restaurant”, aka McDonald’s. Simply put, the Clarendon is comparatively priced. In fact, between 4 and 6 p.m. and after 10 p.m., its prices even best McD’s with its $5 snack menu. The main difference is that one won’t clog your arteries with genetically modified organisms or saturated fat while, at the same time, and quite contrarily, the other one hands you the opportunity to inflame them right back up with a great glass of wine, vintage cocktails or craft beer. In my books, that’s called the best of both worlds. Back to the nitty-gritty: Godsoe. You know that feeling you get when you get older that it seems like everyone is getting younger? But, then to overcompensate, you think you are wiser? Try here at your own risk. Godsoe is younger AND wiser. In other words, he is like his food: a rare treat. It could have taken someone only as dedicated and passionate as David to serve up “big and admirable flavours”, as the Ottawa Citizen’s Peter Hum precisely put it, at low cost. When I talked to the Chef, as glistening morsels of orange-infused duck confit hung from my lips, he gave me a glimpse into how lucky we Capital Dwellers not only were to be so close to locally sourced ingredients, but to farmers and artisans who lavished love and time into their craft of culture. Before reducing, recycling and reusing was the only the way to leave our children a better planet, it was a well-practised dictum in the culinary world. Take mushrooms, for example. The day I spoke to Godsoe, he was expecting 20 crates of delicate wild mushroom varietals for e18hteen. Do you know what the enterprising chef makes out of the leftovers? He makes a mushroom demi for the Clarendon poutine. That’s right, folks: The most succulent poutine in Ottawa is vegetarian. Hit me with a feather. Speaking of vegetarian. My nine-year-old quite dramatically proclaimed she was a “pest-tatarian” (pescetarian) last month, and if I did not already know how limited eating-out options are for people so philosophically inclined, as many of my friends and family are de facto leaf-lovers, her choice really underscored the point. As vegetarianism is on the rise, so is the understanding of savvy restaurateurs in meeting this need. In a playful acronym twist, The Clarendon Tavern’s KFC stands for Kentucky Fried Cauliflower and is quite the Cinderella story: The oft-maligned Brassica Oleracea is a stand-out on the small plate menu with a finger-licking crustilicious rendition of a deep-fried, whisper-sweet, pickled cauliflower. Chef Godsoe coats the florets in a secret blend of 14 spices, and spreads his crackling masterpiece over a thin, chili cashew cheese blanket. Of equal interest, light fare is also on the up and up. 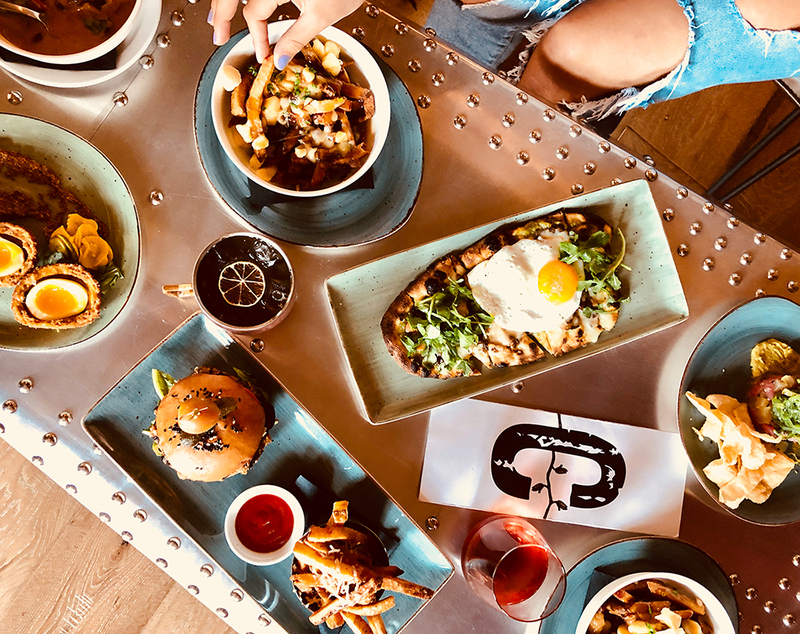 Body-conscious, taste-forward, ethical-minded people have not been left off menu at this Byward Market tavern. Bring on the spicy coconut lemongrass tom yum with shrimp and the fresh-as-roses tuna poke. Vegans have more than a nod with the Hearty Bowl of sprouted grains, chickpeas and cashew dressing, as well as two flatbreads called “Farm Vegetables” and “Olive and Rosemary”, not to mention the heart-warming lentil tourtiere with tomato chutney and mushroom gravy. The development of a menu that will withstand the vagaries of taste and time is a protracted and often painful exercise. It involves a lot of self-doubt, spoiled food and hairsplitting (after it was pulled). 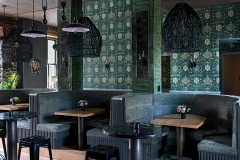 Yet, the design needs to rest on the overarching theme and demographics of the restaurant before the menu is tweaked, before the kitchen is built and, yes, before the ink is dry on the lease of the space, itself. I was told this: The Clarendon needed to feel like a pub, but slightly less pedestrian, look like a tavern, but slightly less cavernous, and, above all, be unique. I would like to take the space to clarify a point that has become important to me: The restaurants I designed were completed on a strict budget—not a shoestring one, by any means, but nowhere close to the added zeroes involved in a Joey’s or a Shore Club outfit, for example. 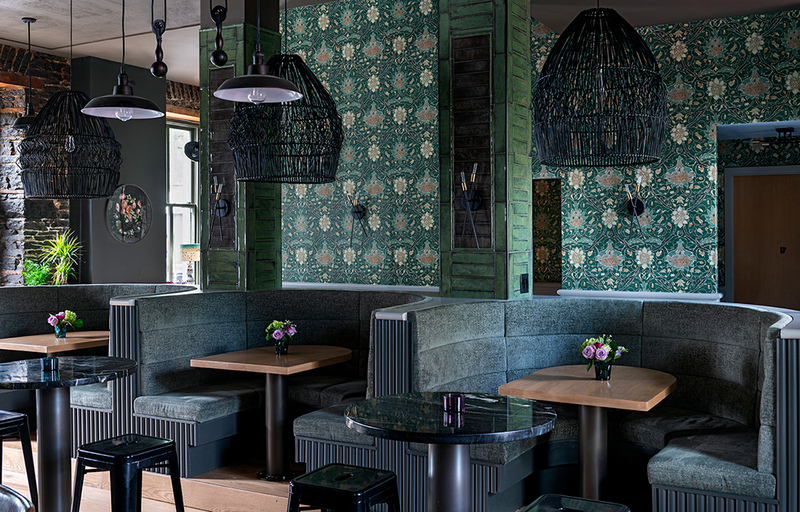 This may be the biggest pitfall of any new restaurateur: overspend on design. In order to not fully shoot myself in the foot here, I want to add that it takes a firm hand to lead an expansion, renovation or full-on new build, and Peter and Caroline have a team of trades that have faithfully worked for them over the decades. 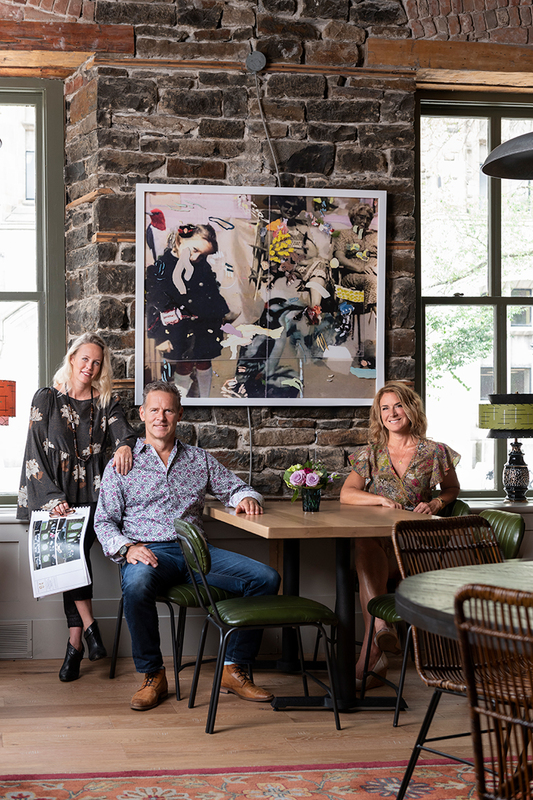 This well-oiled machine supports the chameleonic efforts of our reinventing restaurateurs and may well be the backbone of their true success. 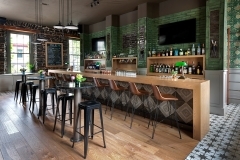 The bar oozes with Portuguese tiles from Euro Tile and Stone and leather stools from Wayfair. 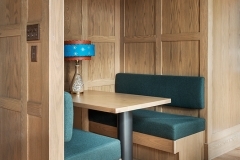 The bar is solid white oak to match the floor, and the panelling in the dining room. The library lights are a nod to the cheeky concept. The Clarendon’s eponymous green and black tiles hark back to my Parisian childhood memories of the corner butcher. 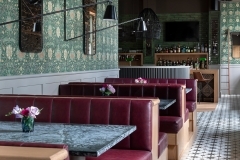 The white, oak panels are a lighter version of my University cafeteria walls at Trinity College, and the distressed floor tiles bring back flashes of my sunny summer visit to the old town of Lisboa, Portugal. 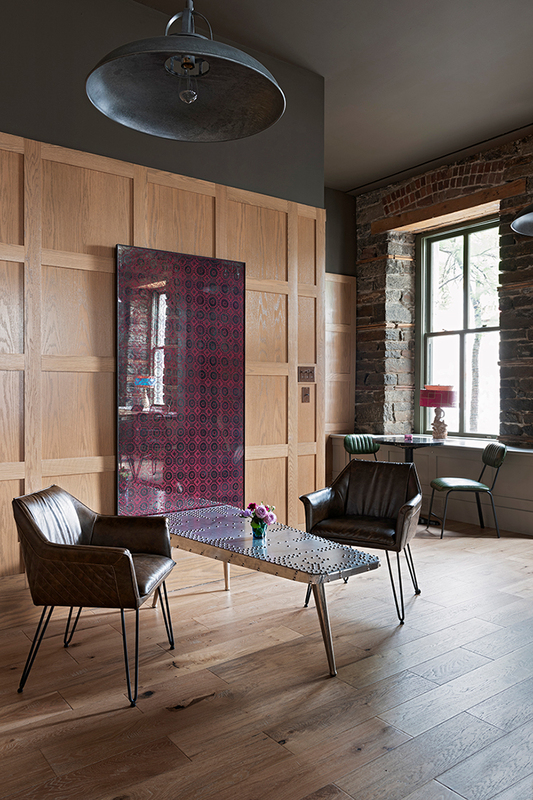 The wallpaper from Cole & Son is a nod to a 19th-century carpetbagger: The man who would knock on your door to sell you an array of ingenious wares held in a large bag made from a recycled wool kilim. Sprinkle in industrial school chairs, oxblood leather banquettes, moss green velvet booths, with lobster-trap wicker lights and presto! You get approachable, recognizable, affordable design that lends itself toward calm, comfort and companionship within its hallowed walls. 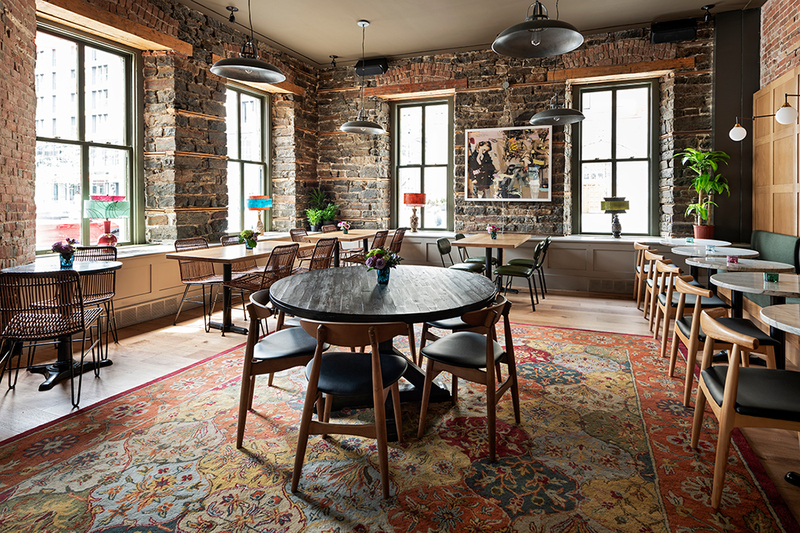 lifted and new oak floors were laid, the washrooms went from grotto to whammo, and an entirely new kitchen with windows facing the street made some of the chefs green with envy. 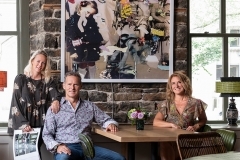 The Clarendon Tavern is my fourth restaurant redesign with Peter Boole, owner of Social, who, together with long-time partner Caroline Gosselin, is also the fearless team behind Byward’s iconic eateries e18hteen and Sidedoor and the up-and-coming jewel “Jackson” at the new Art Gallery of Ottawa. One of my favourite and more labour-intensive touches are the vintage window lights that act like beacons on the deep sills of the Clarendon’s 12 oversized and architecturally preserved windows that wrap around the building from Sussex Drive to George street. 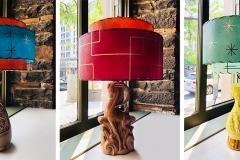 These painted ceramic table lamps were sourced one by one during the course of many months from Vanier Modern and were outfitted by handmade recreated ’50s tiered parchment shades from Retromod Design in Oregon. I handpicked not only the shape and size of the shades but also their colours and patterns. Choosing each one made me feel like a child in an ice cream parlour. Christmas came early the day I unwrapped those cylindrical candy canes. 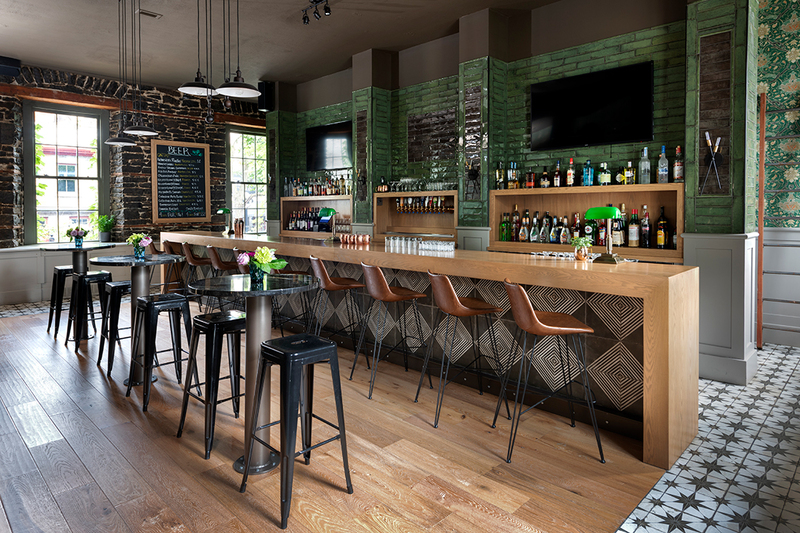 Their visual pleasure made up for the pain caused by the decision to install two large televisions at the bar over the black tile panelling: As a game-changer for the sport crowd and beer-lovers, it also helped to know they were as black as the tile…when turned off. Let it be known that I compromise. I kick and scream only in private—sometimes even into a cushion. I was well brought up like that, wouldn’t you know? Ottawa is not the sleepy hollow it once was, and we must credit the teams of restaurateurs and their designers for this metamorphosis as more than any other partnership, it is they who bring change, colour and craft more swiftly and deftly than any other venue has or can in such a short time frame. Give them praise and see them shine: For their work is not just a collective and collaborative effort, it is a monumental labour of love. This deeply felt journey into the hearts and senses of their patrons is an arduous road that these hard-headed dreamers take willingly and daily. Their sole purpose is to give their all to give you pleasure. If all else fails, happiness is but a Scotch egg away at The Clarendon Tavern.